Although everyone agrees that the food of choice for Shavuot is cheese, most typically blintzes, or a Sephardic equivalent such as bourekas, there are differences of opinion (some quite charming) as to why it is a custom. For Shavuot recipes, click here or go to The Nosher, our lively Jewish food blog! Some derive the practice directly from scripture, saying we eat dairy to symbolize the “land flowing with milk and honey” (Exodus 3:8) promised to the Israelites, or that “milk and honey are under your tongue” (Song of Songs 4:11). These passages, along with “The precepts of the Lord are… sweeter than honey” (Psalm 19:9-11) also indicate we should eat honey, which is customary in some communities. A sage discovered that the initials of the four Hebrew words in Numbers 28:26, which describe the sacrificial meal offering on Shavuot, spell mei halav (from milk), suggesting that dairy food is the acceptable dinner for the festival. At Sinai, the Israelites were considered to be as innocent as newborns, whose food is milk. Those of kabbalistic [mystical] bent equate the numerical value of the word halav, 40 (‘het’=8, ‘lamed’=30, ‘vet’=2), with the number of days Moses spent on Mount Sinai receiving the Ten Commandments and other teachings (Exodus 24:18). Others look to the mountain itself, which is termed in Psalms mount of gavnunim (68:15), meaning many peaks. They connect that description with the Hebrew word gevinah, meaning cheese. Scholars who trace all Jewish customs and rituals to practices common among various ethnic groups claim that spring harvest festivals characteristically featured dairy dishes, perhaps because cheese was produced during that season. There is also support for the custom based on the spiritual development among the Israelites in the wake of Sinai. After the Torah was given, they were obligated to follow its laws, including those governing dietary practice. As they returned to the camp from Revelation, they could not eat the previously prepared meat, which had not been done according to the laws of kashrut [dietary restrictions]. Since butchering and cooking fresh meat would take too long for the tired, hungry Israelites, they took the dairy food that was readily available. Symbolizing modesty, the dairy was also seen as appropriate for the occasion of receiving the Torah, which should always be approached with humility. In some Jewish communities, it is customary to follow the traditional dairy meal with a meat dish (after waiting the requisite 30 minutes per the laws of kashrut, except in places where the rabbis waived the normal separation). The two foods represent the two loaves brought on the festival. We are also supposed to eat meat as a contribution to our joy on a festival day. This can cause practical problems, however, not only in terms of the time lapse, but because you cannot mix milk and meat dishes and utensils. Therefore, it is more common to have a dairy meal on the first evening of Shavuot and then serve meat the next day. 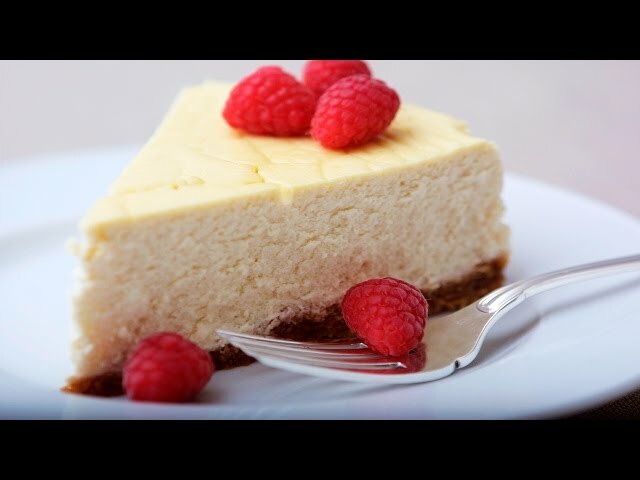 Along with blintzes and bourekas, cheesecake is a widely popular Shavuot item. Some eat kreplach, three-cornered dumplings that are often filled with meat but can be cheese filled or even vegetable filled. They are supposed to remind us of the Bible, which is comprised of three sections (Torah, Nevi’im and Ketuvim / Torah, Prophets and Writings), which was given to Israel through Moses, who was the third child of Amran (after Aaron and Miriam), following three days of preparation (Exodus 19:11) in the third month of the year (Exodus 19:1). When is Shavuot 2018? Click here to find out!